Do you save all the “thank you” letters from your parents? As a daycare Provider, I sure do! These are priceless treasures in my opinion. I remember receiving my first one from a daycare mom. She had written me a thank you note for watching her two-year-old son and along with her thank-yous she wrote “Our favorite is banana!” Of course I knew exactly what she was talking about, laughing and smiling as I read her words. She was referring to the sign language I had taught her son. I still get the giggles about this comment to this day. And an image embedded in my mind of her son, cross-eyed, looking at his index finger while making a peeling motion with his other hand in attempt to sign the word banana. For her to point out “her favorite” in the letter, making it personal, meant the world to me. Just four little words, one being “banana”, but yet so powerful and meaningful! So why would I save all these letters you might ask? Well, the above mentioned is plenty enough reason to keep this particular letter but there are many reasons to save letters from your parents. We all know everybody has their bad days and can use a little bit of encouragement as motivation to get back on your feet. There are days/nights I have self-doubt and just need a little pick-me-up to reassure myself. These are the days I read all of these wondrous treasures of thank you cards and letters from my parents. They took the time to think of me, the caregiver of their child, and write out these thoughtful words. So they must be true! Just remember, there’s nothing better than taking a little time for yourself to gather your thoughts and bring some positivity your way. Reading these letters is a great way to flood your mind with positive thoughts and flush out any negative self-doubts you might be having. Just think of it as a little care package for yourself. Because we all know as child care providers it is important for us to stay healthy both mentally and physically. As I mentioned about the banana and the “cross-eyed” two-year-old boy, these are old memories resurfacing that will hopefully bring a smile to your face just as it did for me. Your mind will begin to wander and you’ll think of other moments you shared with the children. For me, it may be moments like how mom said he signed “thank you” at every house they stopped at while trick-or-treating or the time I opened the door for his mom and he said “Hellooo Baby!“, dragging out each word. We laughed, I still laugh. You see the memories will start trickling in and you’ll soon find yourself starting to feel better. Let your mind do its magic by taking you to these happy places in effort to repair that sad mood of yours. 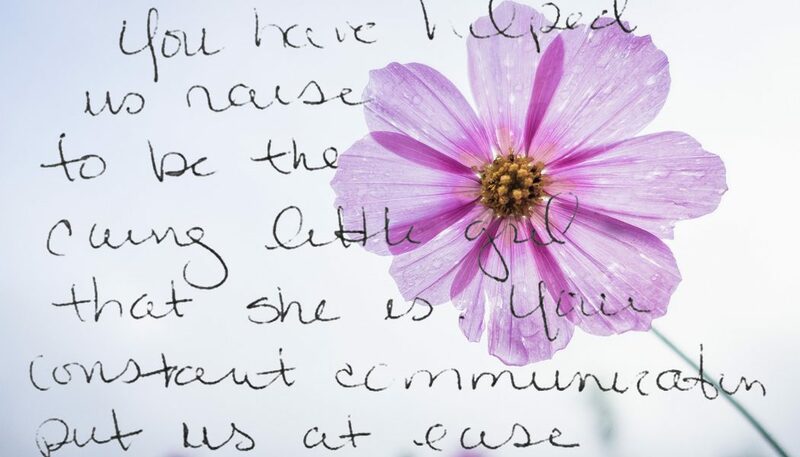 I absolutely love the idea of extracting text from thank you cards, letters, text messages, or emails written by daycare parents and repurposing them as testimonials. To me, it is more of an honest review than asking for parents to write a testimonial for you. It’s natural when not requested…a true representation of you and your child care business. Above is a picture of a letter I received from a daycare parent (names redacted) which is a good example of a letter I would use as a testimonial. If you don’t want to include all the words in your testimonial you can choose to take an excerpt. The below quote is an example of what I would have extracted as a testimonial from this hand-written note left inside a thank you card. This testimonial then becomes a wonderful tribute to represent your business in the community. 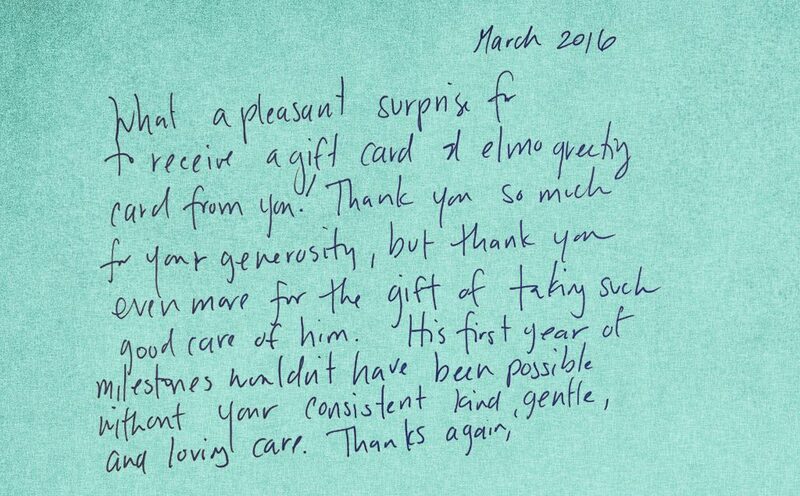 You see these words on a thank you letter to a daycare provider aren’t just words. They are touching, uplifting, and motivating. And to a community the words can indicate that you are respected, trusted, and capable. I hope you all have been blessed with such words and save each one of these treasures.